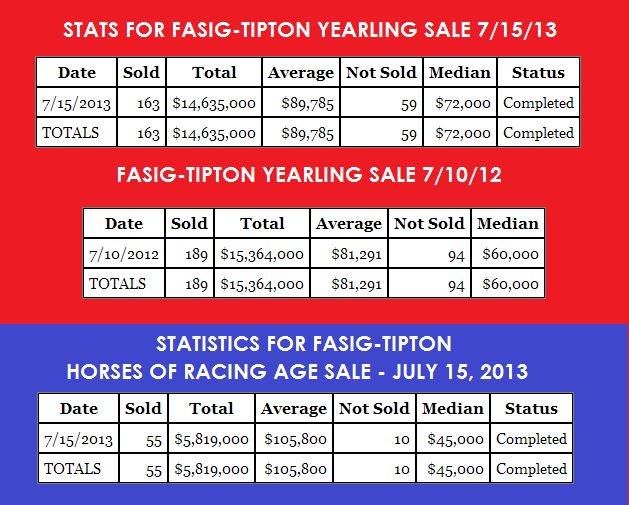 The Fasig-Tipton July Yearling Sale concluded yesterday afternoon with an over 10% increase in average price. While the gross was down $729,000 from last year’s sale, there were 26 fewer horses sold this year as opposed to last year. The sale seemed to be a success overall, with the median up $12,000 from last year’s sale and the buy-back rate down significantly as well. With the decline of the 2012 foal crop, Fasig-Tipton saw a decline of July Sale yearling entries (down 80 horses), so one can guess that they made the decision to hold a horses of racing age sale to supplement the decline. The Fasig-Tipton officials have to be smiling after yesterday with the yearlings selling so well and the Horses of Racing Age Sale raking in a nice $5.8 Million for their clients.